Product prices and availability are accurate as of 2019-04-20 08:06:05 EDT and are subject to change. Any price and availability information displayed on http://www.amazon.com/ at the time of purchase will apply to the purchase of this product. 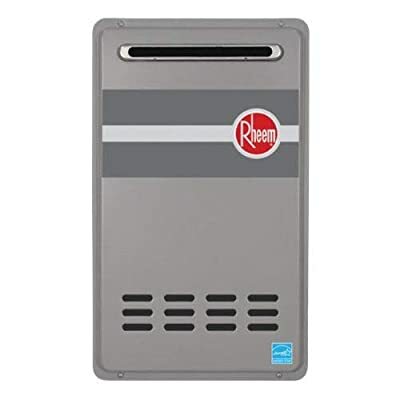 Rheem RTG-95XLP Outdoor Propane Tankless Water Heater Residential Tankless Water Heaters - Rheem tankless gas water heaters offer you the perfect solution to heat your water at home. Imagine never running out of hot water again. Rheem provides to you innovative, new tankless products that provide a continuous supply of hot water from energy efficient and space saving design units. Specifications - 9.5 gal./min. at 35A-Degree F rise max. - 7.4 gal./min. at 45A-Degree F rise : - Outdoor Installation. - New. Next Generation Burner Technology - Industry Best. .26 GPM Minimum Flow Rate.